I'm officially on day 13 of The One Month Finger detangling Challenge. I decided to do a post to let you know what I am doing for those who have started the challenge or are about to start. The goal of this challenge is to get healthier, breakage and split free strands by eliminating combs or brushes. The litmus test will be longer and thicker hair. I began this journey by trimming off splits and knots when the hair was a bit stretched from an old twist out. Then I co washed my hair using VO5 conditioner. After which I deep conditioned with Organic Root Stimulator Replenishing Conditioner mixed with olive oil,pure unrefined coconut oil and mayonnaise. (see details below). I never used a comb. All detangling was done using my fingers. - I parted my dry hair into six sections with my fingers and applied VO5 conditioner to each section, scrunching to totally saturate my hair with conditioner then twisting loosely. - While my hair was still in twists, I wet my whole head with warm water and began massaging my scalp to get the dirt off. I then took down each twist one at a time to thoroughly wash my scalp and hair from roots to tips. I did this by raking my fingers through my hair, feeling for tangles and gently separating them. 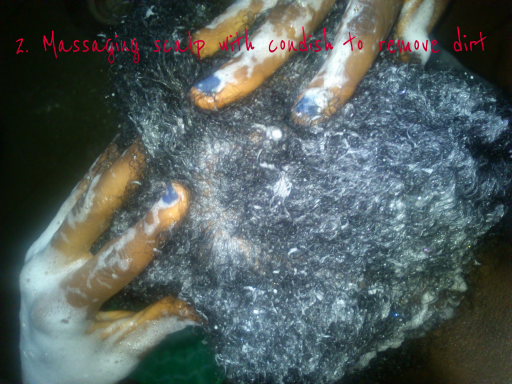 When I came across a difficult tangle, I added more conditioner and gently detangled from bottom up. After detangling, I re-twisted the section and worked on the other sections in the same way. - I rinsed off the hair starting with the first section down to the last, still with warm water. - Once I completely rinsed off the conditioner, I gently removed excess water by using praying hands. That is, I sandwiched my hair between my two palms and smooshed from roots to tip. I then blotted the remaining water using a clean big T-shirt. - I proceeded to deep condition my hair. In a small bowl, I mixed ORS conditioner with a capful of olive oil, two capsful of coconut oil and two tablespoons of mayonnaise. - I applied this mixture all over my hair,untwisting and re-twisting, put on a shower cap and then turbaned with a scarf and went about my normal duties. - About 3- 4 hrs later, I rinsed my hair with cold water, blotted dry with the Tee and proceeded to stretching my hair by braiding. HOW I STRETCHED MY HAIR. I stretch my hair without heat by braiding, twisting or knotting my hair in sections. On rare occasions, I stretch using a blow dryer. I do this to prevent further tangling of my hair once it's dry. My hair tends to dry out easily and becomes brittle. 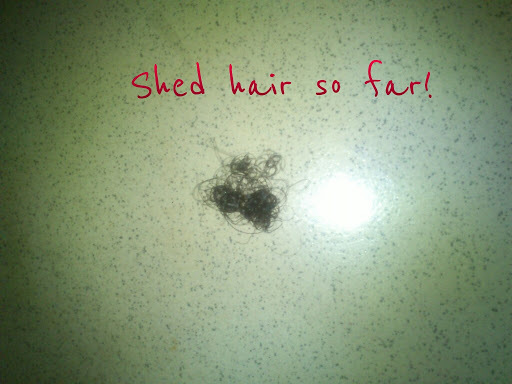 To reduce this, I make use of the LOC method popular in natural circles. I learnt it from here and it has been the best method for retaining moisture so far. 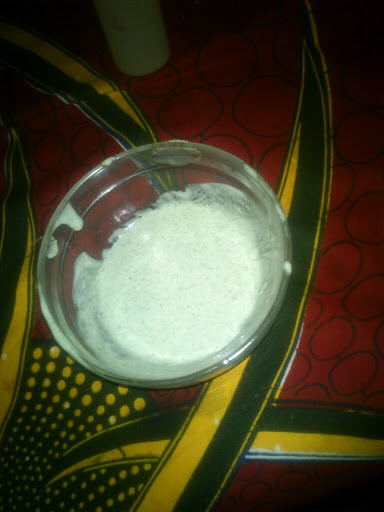 LOC means Liquid ( water), Oil ( could be olive oil, coconut oil or any oil of your choice) and Cream ( hair butter, Shea butter mix, hair moisturising lotion). You apply the products in that order. - I took down each twist and divided it into two. - To each section, I spritzed with a little water (if my hair was dry). Then I applied coconut/olive oil and later my Shea butter mix (aka NappyGirl Curly Butter) concentrating on my ends to prevent breakage. - After this, I braided the hair ( or twist when I'm lazy or in a hurry). By the time my hair was completely dry,it would have been stretched enough for further styling. There you have it and here's my pictures! Then I put on a shower cap and deep conditioned using my own body heat for 3hrs after which I rinsed in cold water and proceeded to moisturise and braid using the LOC method. Thickness of my braids. Once dried and stretched, my hair is ready for styling. I wash my hair biweekly and after every three or four co-wash sessions, I wash with shampoo to remove buildup and then continue with the co washing. This regimen has helped me retain most of my length and I doubt I'll be using combs any time soon. So this is my hair regimen so far. EDIT: During the week, I hennaed using Kani Kone Body Art Quality Henna paste. I just applied the henna to dry sections of my hair concentrating on the tips and left overnight...easy peasy! In the morning, I rinsed out with cold water and stretched as usual. a. Strengthen my hair and reduce breakage. b. Give me red highlights.